We produce shirts for clans, organizations or websites! Expediated manufacturing and shipping is available for an additional charge. Our ever growing selections of designs includes family Coat of Arms, Scottish Clan Badges, Irish Claddagh Badges, Flags, Tartans, Surnames, Celtic, Irish and Scottish designs. Please contact us for a custom quote on bulk orders. 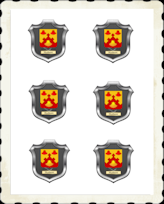 Our Heraldry Database has thousands of Family histories to search. Visit Now! All orders are shipped via the United States postal service. Downloads are sent via Email within 24-48 hours. For business and wholesale orders, please contact us for a discounted price and special shipping instructions. Orders outside of the United States requires additional shipping fees. We offer a 30 day money back guarantee for defects in workmanship. Your satisfaction is our priority! Please tell your friends and family about the Celtic Radio Store!